Dallying In The Dirt, Issue #74 --- A Clematis transplant is needed to make room in the garden. The weather is causing me to be conflicted. In my little corner of the world we have had record high temperatures during the first days of April. The Forsythia is blooming the Tulips are half developed and the neighbourhood has several beds of Narcissus in South facing beds that are in full bloom. My heart says, “Plant the early veggies.” My head says, “It’s only the first week of April!” The plants under the lights are coming along nicely but they are a little small to be planted out because, of course, they were started by the normal calendar. I am under considerable pressure to finish a job that should have been done a few weeks ago; well actually last fall. 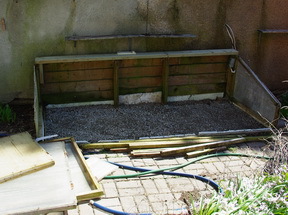 The cold frame is falling apart and must be rebuilt before I can use it. The plants under the lights are crowding each other out and there is no room to start the Tomatoes and Eggplant and several varieties of flowers. I have disassembled it and now it has rained for three days stopping the process. It will get restarted later today. The trip to Newfoundland to celebrate the grandtwins 2nd birthday is the most delightful of the many causes of my procrastination. Bought some Pansies yesterday to put in the porch planters. It is always exciting to do the first outdoor planting and the Pansies are hardy enough to withstand anything that the weatherman can throw at them. They will get replaced in early summer with something that will be happier in the mid-summer heat. 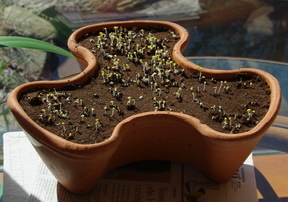 The Tuberous Begonias are all starting to show some signs of growth as are the Callas. I am very excited about one particular little piece of brown stuff that arrived here a week ago. It is a ridiculously expensive Begonia Tuber from Blackmore and Langdon in England. The flowering plants that they produce are amazing and one of my children heard me babbling about them and decided it would make a good Birthday present. There was the tiniest bit of new growth emerging from it when I checked it an hour ago. Not that I check each hour! The fancy Delphiniums have all been transplanted and are looking fine. I have no idea what I am going to do with 60+ Delphiniums but I’m sure I will get several offers to help me reduce my surplus. I need to see them all bloom before I decide which ones to keep and I’m not sure that they will bloom in their first year. There could be a long line of delphiniums along the edge of the garden this summer. I have a blue collection, a pink collection and some bonus seeds that they included. 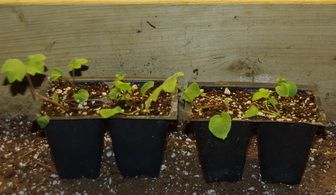 There are three different containers of Mesclun mix started in the basement. Each container has a different mixture of plants in it and they are all from pre mixed packages of Mesclun from Renee’s seeds. It will be interesting to see what kinds of salads and stir fries we get as we sample each of these. I have two of them in quite decorative containers so that could occupy locations on the deck near to the kitchen. Mesclun does not take long to grow and has minimal roots so they do quite nicely in a shallow container that would not support any long term crop. It is an excellent patio or balcony subject that looks as good as it tastes. The Rose that I purchased from Home Depot has been planted and is looking quite well. The display at the store is quite disturbing. These neglected plants now all have elongated yellowish and broken shoots and would have a tough time making the transition to the garden. The really sad part of this, besides the waste of some rather good looking Roses is that beginning gardeners will see these plants at about half the price of the potted ones at the nursery and will take them home, probably have them fail and think that it is their fault. Many may give up on trying gardening as a result and lose out on the lifetime of delightful experiences that gardening provides. To make room for the Rose I have tried something I have never done before. I dug up a very established Clematis, it was too big for the space it was in. Moved it to a better location. 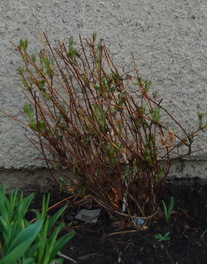 Moved a dwarf Clematis that was new last year into that location, leaving a sunny spot for the new climbing Rose. A three party shuffle is what happens when you have too many plants in a small garden. It will be interesting to see how the older Clematis survives its move. They have a significant root system and it is impossible to move all of it. A ball of roots and soil as large as my aging back would tolerate made the move. They had only just started to break out and they should continue to thrive . I will keep you informed of their progress. I was speaking about my Vertical Vegetables techniques last night and was fascinated by the volume of questions about growing Potatoes. They can be grown quite successfully in containers. The list of my upcoming presentations is posted and reasonably current. Geraldine asks? I purchased soilless mix at a garden center planted my seeds and now have tiny Flies/ nats that seem to be eating their roots in the nymph stage I have done Sticky traps ,water with a little soap and Bt I even sprayed a little raid that Burned some of the little leaves ; Can you help?? Ken Answers! What you have are Fungus gnats and you are correct the nymph stage does do some root damage. The adults are just annoying. Insecticidal soap in the water should help. Biggest tip. They thrive in damp soils. Dry your soil out between waterings as much as possible, difficult with seedlings, and they should greatly diminish. Shirley Asks? I have several Mugo Pines one of which has a 'spraying of white' on the needles. I had noticed this other years, but the pine did not seem to be weakened by it. This spring, it has spread to the whole pine and even to an adjoining one. 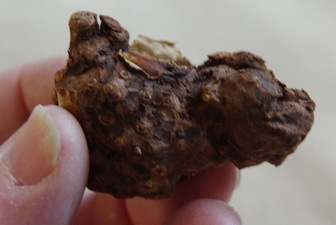 I asked a Master Gardener at Canada Blooms if it could be scale, (though I had never seen it so tiny and white, recognizing only the larger, brown oval shape), and she told me to go to my local nursery to find out if it really was scale and what treatment to use on it. I did scrape a few off, but could find no sign of a 'critter' under the white coating. do you think it could be scale? Ken Answers! It does sound like it could be Pine needle scale which is a white, elongated scale found on the needles. It is often found near the base of the needles rather then the tips and looks rather cottony. Spraying with dormant oil early in the year will give you some pretection.